How long have you owned your coffee house? 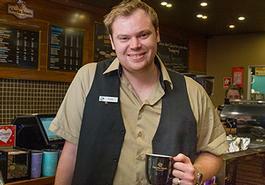 My mum and I have owned the Lismore Gloria Jean’s Coffees coffee house for nine years. What did you do before you opened your store? When we opened the store, I was just out of school and my mum took a step into owning her own business from a career in the banking industry. Why did you decide to open a Gloria Jean's Coffees? We have family in northern NSW and we wanted to be closer to them, so decided to move down from Harvey Bay and open our own coffee house. Why should your local community support your store? We are family-oriented, we’re friendly, and we support the community, especially local schools. Tell us something about you? I love to travel and love taking my dog for walks. Also, last year I won the Australian and International Retail Food Group (RFG) Barista Championship. Each competitor had to produce four espressos, four milk-based beverages and four signature drinks for sensory and technical judges, based on taste, technique and presentation. I’m passionate about pouring a great cup of coffee, the NRL and my family. How is your family involved with your coffee house? This business started with my uncle and then my grandmother worked with him. Down the track, my sister and wife have also worked here. It’s a family owned and operated business through and through!